New York, NY - July 29, 2014 - The Metropolitan Transportation Authority (MTA) today announced a series of new and enhanced safety initiatives to better ensure the safety of its customers and employees. The safety investments are based on new mandates; recommendations by governmental bodies; compliance with existing laws, policies and procedures; and new MTA initiatives such as those supporting New York City’s “Vision Zero” initiative. The MTA’s 2015 budget includes $84 million in safety initiatives, and safety investments will total $363 million over the entire 2015-2018 four-year Financial Plan. The MTA Board will vote on next year’s final Financial Plan in December. Investments will focus on customer and employee safety and training ($46 million per year), increased track and right-of-way inspections and repairs ($21 million per year), upgrades and repairs to signals and signal systems ($8 million per year), and enhanced safety systems and communications with customers and employees ($3 million per year). An additional $6 million per year has been allocated as both the Long Island Rail Road and Metro-North Railroad continue their work to implement Positive Train Control. PTC will enhance existing train dispatching and signaling systems by automatically enforcing temporary and permanent speed restrictions and automatically stopping trains at red signals. New York City Transit will continue to focus on safety as its top priority. The Track Division will bolster inspections and maintenance of critical track corridors and dedicate additional teams for rapid defect verification and rail replacement. Investments will support additional technology for automated inspections as work continues on the full installation of Continuous Welded Rail (CWR). The Signals Division will receive additional resources and staffing analysis identified a need for additional Signal Maintainers to complete critical inspections and maintenance in required cycles. Resources will also be dedicated to ensure critical fire safety and communications equipment are inspected and maintained, including the new Help Point intercoms that are currently being installed. Designed to be both highly visible and easy-to use, these instant digital, instant communications devices offer customers immediate access to assistance and information with the touch of a button. New York City Transit Buses and MTA Bus Company are proactively addressing pedestrian safety at all levels of the organization, in alignment with the New York City Department of Transportation’s “Vision Zero” action plan. This three-pronged approach focuses on employee training and awareness, public awareness and outreach, and technology and street engineering. Safety initiatives underway include increased and targeted observational rides and on-street observations, and direct engagement with bus operators to provide effective feedback and open dialogue on safety issues. Bus operator training has been increased with specific emphasis on managing the current challenges of distracted pedestrians and the proliferation of cyclists, and managers are reviewing bus operator hours of service to minimize any impact on bus operations. In addition, various public awareness campaigns have been implemented and are underway to educate bus customers, pedestrians and cyclists how to remain safe in and around buses. The MTA has installed security cameras on 1,546 buses which assist with investigating accidents as well as focusing accident mitigation efforts. The MTA is continuing to research new technologies to help mitigate collisions, which may be implemented in pilot programs to test them in service. The MTA is also enhancing its collaboration with the city Department of Transportation on traffic engineering and street-scaping at high-incidence collision intersections, curbs, and other areas. 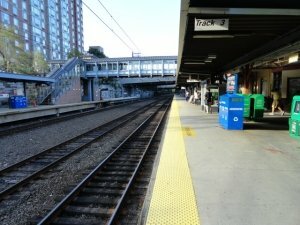 Building upon a series of initiatives that Metro-North Railroad developed as part of its 100-Day Plan announced last month, the Long Island Rail Road and Metro-North are working closely together to develop a series of initiatives to enhance the safety of rail passengers and employees. That has led in part to a series of newly announced LIRR initiatives. The LIRR is also assessing its safety culture and compliance with regulations and industry standards. As a result of these collaborative efforts, the LIRR will install video cameras in both the engineer’s cab and passenger compartments of its diesel fleet and the majority of its electric fleet. The LIRR will also establish a Corporate Accident Investigation Unit. This new four-person unit, combining the expertise of the LIRR’s Transportation, Engineering and Maintenance of Equipment departments will be on call 24/7 to respond to employee, customer and rail incidents with responsibility for investigations as well as the implementation of corrective actions as necessary. In addition, the LIRR’s Maintenance of Way Division will invest in electronic devices to support track inspections that will ensure the integrity of data, enable trend analysis, and allow for real time communication of critical findings from the field. Track maintenance through rail grinding and track surfacing will be increased in order to mitigate the risk of rail defects and the potential for broken rails. Efforts will also begin to eliminate rail joints, enhancing the strength of the rail system. A new Wheel Impact Detector System will also monitor wheels for defects occurring since previous inspections. Last May, Metro-North announced a wide-ranging series of steps it was taking to improve safety. Today’s budget announcement defines the funding for many of those initiatives. Metro-North’s comprehensive list of safety initiatives is available online as part of the railroad’s 100-Day Plan, released in June. They include the establishment of a comprehensive Office of System Safety, mitigating risks associated with employee fatigue, installing outward- and inward-facing video and audio recorders on trains, employing advanced track inspection technology and ensuring track is maintained to Metro-North standards. In addition to the ongoing safety program at MTA Bridges and Tunnels (B&T), several new initiatives will be implemented to advance current efforts in this area. B&T has contracted with gothamCulture to assist in shaping safety culture at every level of the agency, emphasizing both the design of safe systems and the most effective strategies for mitigating safety risks attributed to human factors. B&T will invest in safety monitoring to provide a consistent and continual on-site presence that will keep B&T engineers and safety managers up-to-date on safety and compliance issues, enabling quicker and more targeted intervention to prevent serious accidents and injuries. In October 2013, B&T began a pilot program at the Verrazano-Narrows Bridge for accepting credit/debit cards as a method of payment from commercial customers to mitigate potential safety hazards of pulling vehicles to the side and turning them around. The pilot has been successful and B&T will be expanding the program to include both cars and commercial vehicles at all facilities. Convening a Safety Task Force to address ongoing safety concerns between management and union safety representatives. Subject: LongIsland.com - Your Name sent you Article details of "MTA to Invest in Additional Safety Measures"